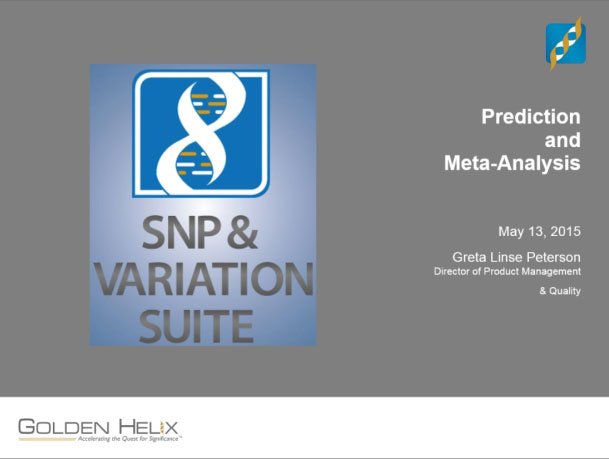 We are excited to announce and demonstrate some new and highly requested features in this webcast, including predicting phenotypes by applying existing GBLUP or Bayesian models and meta-analysis for GWAS studies. Recently in SVS we added additional genomic prediction tools such as Bayesian Genomic Prediction and K-Fold Cross Validation. We have continued to build out the prediction suite of tools by adding the ability to apply the results of a model to a new genomic dataset to predict the phenotype. This is designed to work hand-in-hand with the output of K-Fold cross-validation using either GBLUP or Bayes C/C-pi. Next we will provide a sneak-peak at the upcoming meta-analysis feature. This was one of the most requested features in our latest customer survey. Including this feature in SVS will combine the power of the numerous file imports and data visualization with the standard meta-analysis methods in use today. Join us as we explore how these new features can stream-line your analysis and provide additional insight into your results.